Camera – Acer Crystal Eye web cam. Warranty – One Year International warranty. The Problem: Though this is a wonderful laptop, I faced few problems with it. For example Linux drivers for all the components are not included even in the biggest distros. Though with some geeky tactics I managed to get it to work successfully. The other problem that most of the Acer 4520 user face is keyboard Lag problem (also known as Sticky Keys problem) where sometimes the key respond some time after it has been pressed or even few key strokes may not get registered if you type too fast. I searched for \’Amd Dual Core Processor\’ at Google and found your post named \’by GeekLord.com\’ in search results. Quite interesting to read. You don`t need to flash new BIOS to solve the keyboard lag problem. Simply disable the touchpad (Fn + F7), and use external USB mouse. But it will be a problem if you use the laptop outdoor. But for me it`s work well enough. Also I find touch pad much productive solution than a small mouse(portable/mini USB mouse) so I had to find a new way. how do u turn on the bluetooth and wi fi on Acer Aspire 4520.,..
To turn on bluetooth or WiFi on Acer Aspire 4520 you simply need to press the buttons given on top of keyboard. Also you need to install the drivers for bluetooth and WiFi before you can use them. I need help? I have Acer Laptop 4520, when i press the bluetooh button is not work, even no light is switch on. So is that this model is no bluetooh hardware. I have use device manager to searching my hardware part, but is didnt show me that have bluetooh. So how do i know my laptop is realy have bluetooh or not? If have, then why i cant get use it. & what should i do? Please give me information. Thank you! 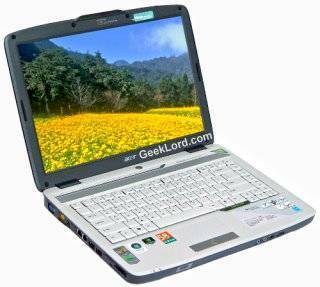 @confused08: Install the Bluetooth Drivers from the Supplied CD, then simply press the bluetooth button on the laptop. You may also select Fedora as an alternative distro, and if you choose fedora then visit: http://fedora4520.blogspot.com/search/label/acer%20aspire%204520 for more Linux related help for Acer Aspire 4520. If it is still not working contact Acer Support. Acer Aspire 4520 does not have bluetooth. It has the button but no device is installed. All the drivers on earth wont make it work. I have no idea why they would put the button there but not the hardware. Also you dont need to install drivers for the wifi you should be able to open the box plug in the computer and set up the wifi and be on the net. Most computers now dont come with disks anymore. Mine came with vista preinstalled. If i need to reinstall i can use the recovery option but if my HDD takes a crap i have to pay Acer to send me a disk. I must say that this is a very capable laptop though very impressive for $450 USD. It plays FFXI and every other graphics intensive game i have thrown at it. i have acer 5920z linux base laptop.i purchased today and insalled wndows p rpofessional , my laptop is not shuting down when i clck on shut down. please help me as soon as possible i have 2 project work. please sir which step can i follow to resolve this problem. orelse mine is still under warranty …. HI,, ive installed fedora on my aspire 4520 and now would like to install windows xp on ti.. I dono wut the problems because once i try reboot using cd , it DOESN’T run anything .. can u give some opinion on it ? The 4520 depending on region does not have bluetooth. In Canada where I am all 4520 i have seen do not have the device installed. Yes the button is there but it is useless. I have an ACER Aspire 4520 and tried to install WINXP (sp2) in it.All devices except for the sound card are working properly.Do you know of any fixes for this problem. I arrived here via Google. I have a 4520 as well; for the most part I am pleased with it. However, I can’t get Wifi working under Ubuntu. I just updated to 8.10 and installed “linux-backports-modules-2.6.27-7-generic” which contains the ath5k module, which I am understand supports the AR242x chipset. but NetworkManager doesn’t see it. At this point, I am wondering whether the Atheros card is *actually switched on*. Pressing the appropriate button in that narrow line of keys above the keyboard has no effect. I would also expect a LED to go on and off as well as the device becoming visible as a network device. When I booted my previous Acer, the WiFi interface was active by default, and a rather bright orange LED embedded in an on/off button at the front of the notebook indicated this. When you press the WiFi button, does an LED (like with the CapsLock indicator) get turned on and off? Alas, I scrubbed Vista when I bought this thing, so I can’t test the WiFi under Windows. I have vista installed, laptop is aspire 4520 just from few days while chatting if I want to invite someone on webcam the I was getting message as “webcam not connected, but after I restart my system i worked. But Now If I restart my system also then it does not work. I have this laptop but it didn’t come with any sort of restore/backup discs or whatever you call them (I’m not much of a computer expert). I was wondering if you knew where I could find them or if the computer has them saved already? i have the aspire 4520 and so far except for some minor problems like the jumping cursor and bad sound everything’s fine. however, i do notice that the cd drive or maybe the software(?) seem to have a problem. i hardly use it coz either the media player would suddenly freeze or it will have an error message. today, while watching a dvd it suddenly froze and then the cd drive wont respond anymore. it wont even open so that i could at least take out the cd! does anyone have any idea what’s wrong? im not techie so can somebody help me. thanks! @Warlord: You may try restarting the system. Also check if you’ve any process running which might be using the camera. You may also try to reinstall the camera drivers. @War: You have to set change the boot sequence from the bios so that the laptop may know that you wish to boot from the CD. Assuming that you’ve CD Drive as your first boot option, you may try to use another bootable XP disk, as the current disk may have been corrupted. You may order a Replacement disk from Microsoft for nominal charges[ http://support.microsoft.com/kb/326246 ]. @Bleadla: In that case you may use USB bluetooth dongle. hi…a have acer aspire 4520. there is some problem bout my laptop, like warlord my camera is busy or sometimes is alright n sometimes is not connected. i m reinstalling the driver more than 2 times since i have the problem for my camera. and another problem is when i play a game, sometimes my laptop is automatically restart. my monitor becoming blue and restart. and i dont know what is that. is that problem is from my hardware or not? and may i ask u 1 times again…. is there any problem if i increasing my memory from 512 into 1.5 giga? Looks like your system drivers are corrupted or your RAM is faulty. You may try reinstalling the windows (clean install), if the problem persists – take your laptop to the local Acer Support Center. Increasing RAM from 512MB to 1.5 GB would definitely improve performance of your system as newer games and softwares demand more RAM. I’m going to get a new wheels. Wish to have a luxury one, but don’t know for sure what to choose… Can somebody advise me smth? bios update work well, in fixing keyboard problem. I must typ so slow if I typ fast, just go every things typ to each others, and jumping from one to others prts of the line is happen all the time? i hav bought tht last year in march2008. i hav e problem with DVD writer in month of december. after complainting company change the DVd writer. but after 2months in month of aprail problem same occur regarding DVD writer. i m not using daily this writer. after tht when i try to complaint they say ur warranty period ended. u repair its ur self . Could you please let us know how to install the BIOS update in the Acer 4520 laptop. I m having acer aspire 4520 laptop with windows vista OS. Prob is that BT is not working even i hv installed drivers. pls help me resolve this problem. Hi! I have an Aspire 4520 which I have upgraded to Win 7 Ultimate. OS is totally up to date and everything works fine, except for the FN key. I have tried the following shortcuts: FN + F11, FN + F12, FN + F11 + F12, FN + F2 but still none of the functions work (i.e. FN + 2 for the @ sign). Any ideas? Thanks! To solve the lag in sound when pressing the keyboard, press Fn+F7 or whatever the combination you use to assingn the monitor output, this is a bug with the monitor output signal. I also have an Aspire 4520 that I upgraded to Win 7 Ultimate. It originally came with Vista and a bunch of bundled Acer programs. I liked the bundled programs but not Vista but unfortunately lost the Acer programs when I upgraded. I’ve tried to reinstall some of them but very few of them work on Win 7. Also, I can’t get my wireless LAN to work ðŸ™� I’ve tried control panel but it doesn’t work. I’ve looked on the Acer site for a LAN wireless driver but they don’t have one for Win 7 for this model. Does anyone have any ideas?????? If so, please email to: [email protected] Thank you! I just downloaded the program to flash/update the BIOS for the Aspire 4520 but it won’t install. I get an error message involving administrator privileges or something, relog in, error message 5. Now what do I do? By the way, my laptop has the bluetooth button on top but also never came with bluetooth. I remember speaking with Acer and they said mine didn’t have one. Never mind. I fixed the WAN wireless problem. I really appreciate what you write on here. I try and come back to your blog every day so keep up the good posts! I am new to blogging and having material out there. Your post here is pretty beneficial and gives me much more awareness about producing an impact when commenting. Please continue your blogposts and I can continue to go through all of them. While most models of Acer Extensa include a wireless local area network module that allows the computer to pick up and transmit wireless radio signals, not all Extensas come with a Bluetooth module. Those that do, however, include two switches: one to turn the Bluetooth radio on and off, and one to turn the Wi-Fi radio on and off. While it’s recommended that you disable your wireless and Bluetooth radios when not in use, so as to protect your PC from hackers, you can easily turn them back on as needed. i got a problem w/ my acer 4520, my wi fi sudden gone sometimes i need to uninstall the driver b4 it works again, sometimes i need to clean the adapter b4 it works,what should i do pls help..
i got a problem w/ my acer 4520, my wi fi sudden gone sometimes i need to uninstall the driver b4 it works again, sometimes i need to clean the adapter b4 it works,what should i do pls help.. do i need to flash the BIOS? The CPU cabinet is opened by removing the side panels of the cabinet. and capabilities of their computers and to avoid any problems.